No longer a throwaway Chinese brand found only in obscure online shops or eBay, Godox products are now widely distributed in Europe by companies such as Walimex and Elemental. 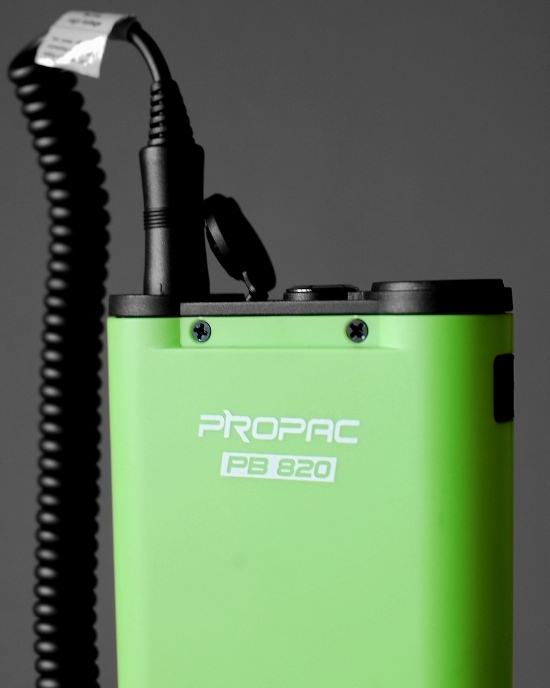 Their latest multi-front assault on the portable flash market include the Leadpower LP750 pure sine wave battery pack, the Reemix RMII wireless trigger and Propac PB-820 high voltage battery pack, reviewed here. The most striking feature of the Godox Propac is its lime green cover. For the less brash photographers amongst us, fear not, the PB-820 is also available in black. The top panel is incredibly simple, featuring a single DIN 45326 socket (compatible with Quantum Turbo cables) which doubles up as both the output and input port. Power is controlled by a simple on/off button and charging status is displayed by a ring of LEDs. Strap lugs on each side allow the fitting of a shoulder strap (no strap is included) or there is a belt clip. Warning: The Godox Propac is not compatible with all types of Quantum chargers, despite what is written in their instruction manual. Please see here for more information. Most surprising for me was the battery pack’s light weight. The Propac is a mere 502 grams which belies its size (150*104*44mm). From this compact package the manufacturer claims you can get up to 320 full power flashes. Inside the Propac is a 9.6V nickel metal hydride 2000 mAh battery. Working in events photography, I regularly use the Propac with an on-camera TTL Nikon SB-800 and take well over 300 bounce flash photographs in a night. I’ve never seen the unit below half charge, even when neglecting to charge the pack between two jobs. Indeed, my AA batteries, effectively only powering the speedlight’s liquid crystal display, ran out more quickly than the Propac. For European users at least, cables are easy to come by. Elemental Europe sell Sony, Canon and Nikon cords for £20 apiece, while Walimex Pro also have them for around €20. Quantum cords, by comparison, go for over £40. The Din connector is secure and reliable and I have never feared for it coming loose, even pushing and shoving with revellers in a crowded nightclub. Even with half a pint of someone’s drink spilled on the pack, nobody got electrocuted and there were no apparent electrical problems. That said, don’t try this at home! With AA batteries alone, a Nikon SB-800 recycles from a full power flash in around 5 seconds or so. With the Propac, that time is slashed to under a second. You can buy the Godox Propac PB820 for around US$200 on eBay, €160 from Foto-Walser and £159 from Elemental. Update: This battery pack is now sold in the USA, rebranded as the Bolt Cyclone by B&H Photo.